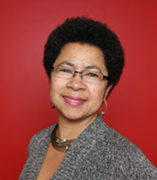 Barbara Ransby is an historian, writer, and longtime political activist. Ransby has published dozens of articles and essays in popular and scholarly venues. She is most notably the author of an award-winning biography of civil rights activist Ella Baker, entitled Ella Baker and the Black Freedom Movement: A Radical Democratic Vision(University of North Carolina, 2003), which won no less than six major awards. Barbara’s most recent book is Eslanda: The Large and Unconventional Life of Mrs. Paul Robeson (Yale University Press, January 2013). She serves on the editorial boards of The Black Commentator (an online journal); the London-based journal, Race and Class; the Justice, Power and Politics Series at University of North Carolina Press; and the Scholar’s Advisory Committee of Ms. magazine. In the summer of 2012 she became the second Editor-in-Chief of SOULS, a critical journal of Black Politics, Culture and Society published quarterly. Professor Ransby received a BA in History from Columbia University and an MA and PhD in History from the University of Michigan.